Once I figured out that it's easier to bake the cookies on the same parchment paper that you cut them out on, the recipe worked very well for our purposes. I actually don't love sugar cookies to eat--I prefer chewy cookies with some sort of chocolate--but they cooked up nicely and the boys love them. Place oven racks so the oven is divided into thirds. Preheat oven to 350F. Refrigerate the dough for 30 minutes. This step isn't absolutely necessary, nor is refrigerating each time you roll out the dough, but it does make the dough easier to manage. Remove one third of the dough and leave the rest in the fridge. Spray a cookie-sheet sized piece of parchment paper with cooking spray. Use a lightly floured rolling pin to roll out the dough on the parchment paper, until it's about 1/8 of an inch thick. Dip the cookie cutters in flour to prevent sticking, and then cut out shapes. Leave 1/2-3/4 inch between cookies. Use the tip of a knife to help lift and peel away the between-cookie pieces, and leave the cookies on the parchment. Slide the parchment paper with the cookies onto a cookie sheet. Gather the dough scraps, place back in the fridge, and remove the next bunch of dough to roll out. Repeat as needed. Bake the cookies for 8-12 minutes, until they look slightly golden around the edges. Slide the parchment paper off of the cookie sheet onto a cooling rack to cool. If using icing: mix the icing as the cookies cool. Spread icing on cookies with a butter knife, or place some of each color in a plastic bag, seal the top of the bag, and cut a tiny hole in one corner of each bag with scissors. Squeeze the icing out of the hole to decorate as desired. Leave the cookies on the racks to air-dry the icing. When the icing is hard, store the cookies in an airtight container, separated by layers of wax paper. Another decorating option: brush each cookie with some egg glaze, and sprinkle with finely chopped nuts, cinnamon, or sugar. Egg white is clear, and the whole egg results in a golden color. To make the glaze, mix beaten egg white or whole egg with 1 teas water. Combine the butter, sifted sugar, and vanilla or lemon juice in a medium bowl and beat with an electric mixer until smooth. Add enough milk or water a drop at a time to make the icing smooth enough to spread. Cover the icing when it's not being used, with plastic wrap or a clean,wet washcloth. For Thanksgiving I often make one apple cranberry pie and then try something new. This year I tried these cookie bars. At first I thought they were too sweet, even after switching the chocolate to dark instead of semi-sweet, but then they grew on me and they were popular with one of the littles in the household. They were a hit at a small family gathering, too! Also, I swear these get better after sitting a day or two. I didn't make any high altitude adjustments, and I didn't notice any problems. Yields a 9x13 pan or 2 "pies"
Preheat the oven to 350 degrees F. Line a 9x13 pan or 2 pie plates with parchment paper allowing the side to hang over the dish. In a large mixing bowl or bowl of a stand mixer, combine the unsalted butter, brown sugar, salt, and 2 teaspoons vanilla. Using a mixer beat the mixture until it is smooth, scraping down the sides a few times. Add the flour and water, and beat until combined. Press the dough into the prepared baking pan. Bake for 15 minutes or until the crust is lightly golden; remove from oven. Meanwhile, make the "caramel" sauce. Heat salted butter in a medium sauce pan over medium heat until lightly toasted, about 3 minutes. Add the sweetened condensed milk and maple syrup. Cook the sauce over low heat for 8-10 minute, stirring often to prevent the caramel from burning and sticking to the pan. Cook until it thickens slightly and turns light golden in color. Remove from the heat and stir in 1 teaspoon vanilla. Sprinkle the top of the cookie base with chocolate chips. Next, sprinkle on the nuts and 1 cup shredded coconut. Pour the "caramel" over top of everything in an even layer. If needed, use a spoon to gently spread the caramel. Sprinkle the top with the remaining coconut. Bake for 20-25 minutes or until the top is beginning to brown and caramelize. Serve either warm or cool. This will likely be the last raspberry recipe until next year. We feel fortunate to have enjoyed such abundance. 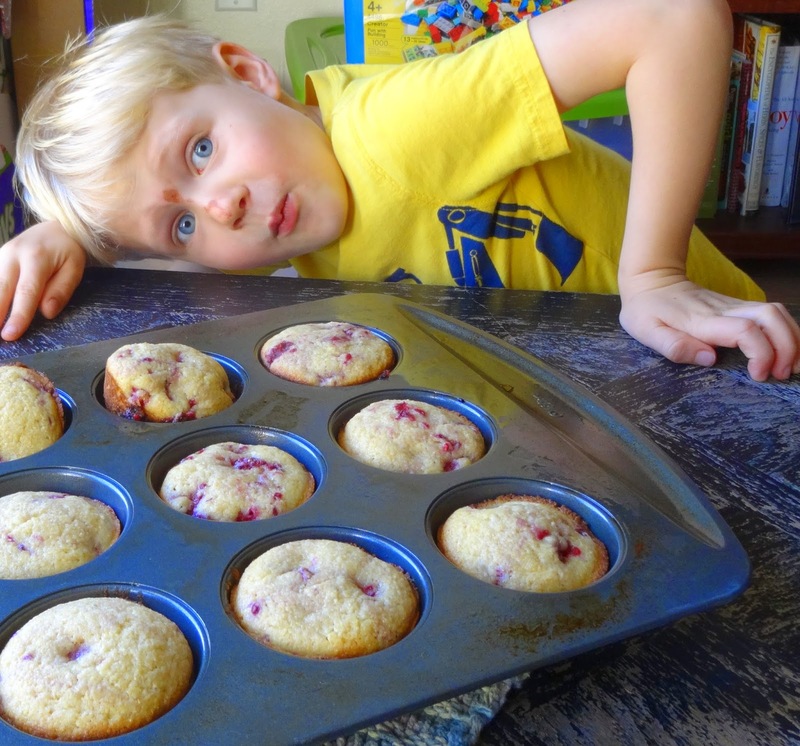 Preheat oven to 350F and prepare muffin tins with paper liners, butter, or cooking spray. In a large bowl mix dry ingredients. In a small bowl, combine the eggs, butter, and milk. Stir into dry ingredients and mix well for about 1 minute. Stir in sour cream until mostly incorporated. Gently fold in the raspberries. Fill muffin cups 3/4 c full. Bake for 20-25 minutes (depending on your oven, it took about 17 minutes today). Test with a toothpick, making sure it comes out clean. Remove from oven; after 5 minutes place on cooling rack. Eat while warm or at room temperature. With some strategic placement of old sheets and assorted other row covers, I was able to keep below freezing temperatures from totally wiping out my zucchini plants. Unlike many who may be tired of zucchini production by now, I'm still happy to have a harvest since I didn't plant my seeds until August (in a successful attempt to thwart squash bugs). Here is one more zucchini recipe to enjoy this growing season as well as those in the future. Grind the almonds, Parmesan, garlic, and red pepper flakes in a food processor until they are finely chopped. Add the lemon juice, salt and olive oil and pulse a few times, until combined. Pour the dressing in the bottom of a large salad bowl, and turn the bowl so the dressing rolls up and around the sides of the bowl. Using a vegetable peeler (a Y-peeler or a mandolin work best, but any peeler will do) slice the zucchini into ribbons about 1/16 of an inch thick. Work from the top to bottom of each zucchini. Place the ribbons in the dressing-coated bowl. Toss the ribbons gently with your hands, attempting to coat the zucchini as evenly as possible. Serve at room temperature. The longer the salad sits out, the more relaxed the ribbons will be. I think this is better when the ribbons are on the crisp side. Before fruit season is completely over, here's a delicious crisp. I love the cardamom in it. The source is lost in the sands of time, but I'm glad the recipe itself isn't! Preheat oven to 375F. Place fruit in a 9x13 baking dish. Stir in the granulated sugar. Combine the oats, brown sugar, flour, and spices. Cut in butter until mixture resembles coarse crumbs. Stir in nuts. Sprinkle topping over filling. Bake crisp for approximately 40 minutes or until fruit is tender and topping is golden. Serve with vanilla ice cream. I'm enjoying a deluge of berries so I'm always on the lookout for desserts that can be enhanced by either raspberries or strawberries. Recently I watched an episode of America's Test Kitchen which featured this lemon pie which I imagined would go well with some berries, either sliced or macerated. I was right. This recipe uses raw egg whites in the filling. You may wish to purchase pasteurized eggs or egg whites if you feel concerned about serving raw egg whites. Heat oven to 325F. Process graham crackers in a food processor until finely ground. You should have 1 1/4 cups crumbs. Add sugar and salt and pulse to combine. Add melted butter and pulse until the mixture resembles wet sand. Place the crumbs into a 9-inch pie plate. Press crumbs evenly into bottom and up the sides of the plate. Bake until crust is lightly browned, 15-18 minutes. Allow to cool completely. Sprinkle 1/2 teas gelatin over 2 T water in a small bowl and let sit until gelatin has softened, about 5 minutes. Repeat with a second small bowl, letting 1/2 teas gelatin dissolve in 2 T water. Whisk 2 eggs and 3 yolks in a saucepan . Add 1 c sugar, cornstarch, and salt and stir well. Whisk in the lemon zest and juice and heavy cream. Cook over medium-low heat, stirring constantly, until the mixture has thickened and is slightly translucent. The mixture should measure about 170F. Stir in one water/gelatin mixture until dissolved. Remove the pan from the heat and let stand for 2 minutes. Remove 1 1/4 c curd from the pan and pour it through a fine-mesh strainer placed over a bowl. (This will ensure the curd is completely smooth.) Do not wash the bowl or the strainer. Carefully pour the strained curd into the prepared pie shell and spread into an even layer. Place in the freezer. Add the remaining gelatin/water mixture and the cream cheese to the remaining curd in the saucepan and whisk to combine. If the curd has cooled and the cream cheese doesn't melt, place the pan on very low heat and continue stirring until the cream cheese is incorporated. Pour this mixture through the strainer into the bowl. Whip 3 egg whites on medium-low (best in a stand mixer, but a hand mixer will work, too) until foamy and add the remaining 1/4 c sugar, raising the speed of the mixer to medium-high . Whip until egg whites are glossy and stiff. Add the curd/cream cheese mixture and whip on medium speed until few streaks remain. Scrape the sides of the bowl and stir the mixture until no streaks remain. Remove the pie shell from the freezer and pour the chiffon over the curd, allowing the chiffon to mound a bit in the center. Refrigerate for 4 hours or up to 2 days before serving. Serve with fresh berries and berry coulis or macerate berries for a few hours before serving. I'm sure this would be equally good with blackberries or blueberries. In my region, we are just about done with corn-on-the cob season; darn it. This is the last thing I made with fresh corn. I think it could be made with a high quality frozen corn, but I haven't done it so I can't be sure. I imagine that some of the nice crunch from fresh corn would be lost. This would probably be prettier with yellow corn rather than white. Most recipes for risotto, including this one require a lot of attention while stirring in the small increments of liquid. Cook's Illustrated Magazine has a technique for avoiding the more labor intensive method. Check it out. This recipe calls for making a stock out of the corn cobs which might seem like it would take too long. However, when I made it the stock simmered away as I gathered ingredients and prepped before beginning. I felt the extra effort worthwhile since the homemade stock intensifies the corn flavor. If you prefer to streamline, low-sodium chicken broth would taste great, too. Combine all ingredients with water in a large saucepan. Bring to a boil over high heat. Reduce to a simmer and cover; let cook for 30 minutes. Strain through a fine-mesh strainer. Add enough water to bring liquid back to 6 cups. Keep warm. Melt 1 T butter in a saute pan or large saucepan over medium low-heat. Add leek and cook, stirring occasionally, until softened but not browned. Add salt and pepper. Stir in rice and cook while stirring, until grains look slightly translucent. Pour in the wine and cook, stirring, until it has been absorbed, a couple of minutes. Add a 1/2-3/4 c (or a ladle full) of hot stock to the rice mixture and cook, stirring constantly, until the rice has absorbed all the liquid. Continue cooking while stirring continuously, adding another portion of stock whenever the risotto looks dry. When half the stock has been added, stir in the corn. (If you use frozen corn, you may want to wait until 3/4 of the stock has been added.) Continue cooking until all of the stock has been incorporated and corn is tender. The rice should be creamy and tender with a little resistance to the bite. Turn off the heat and stir in the Parmesan and remaining tablespoon of butter. Cover and let stand for 5 minutes. If it has thickened, you can add a small amount of hot water or stock to loosen it. Whip the cream until it holds stiff peaks. Stir the risotto and adjust seasoning if needed. Immediately before serving, stir in the chives, if using, then gently fold in the cream. (To tell the truth, I'm not sure what purpose is served by whipping the cream before stirring it in. I predict that stirring in liquid cream would be just as tasty a bit faster. Serve topped with basil. Note: If you prefer to keep your cooking alcohol free, make a substitute such as this: mix 3 parts white grape juice with 1 part white wine vinegar. Of the various suggestions, I believe this sounds best. Something to use up our raspberries which are producing more than six pounds a day. Heat the oven to 375F. Using two long pieces of aluminum foil, line a 9X13 cake pan, extending at least two sides to act as an overhang for lifting the bars out of the pan. This is easiest to do when using two pieces of foil crossing each other in the pan and you may have to fold the foil to make it fit well. Make sure the foil covers the bottom and the sides entirely. In a stand mixer with a paddle, mix flour, granulated sugar, and salt until well combined. With the machine on low, add the butter, one piece at a time (excluding the 2 T at room temperature). Continue mixing until the mixture looks like damp sand. You may also use a food processor: process the flour, granulated sugar, and salt until combined. Place the 16 pieces of butter in the processor bowl and pulse (approximately 20 times) until the mixture resembles damp sand. Don't wash the processor bowl. Set aside 1 1/4 c of the flour mixture. Place the remaining flour mixture evenly in the foil-lined pan. Use your hands or the flat bottom of a measuring cup to press the mixture into an even layer. Bake it until the edges begin to brown, approximately 14-18 minutes. For the streusel: while the crust bakes, place the brown sugar, oats, and nuts to the reserved flour mixture into the food processor bowl (or toss in the mixer bowl). Work in the remaining 2 T butter, either by pulsing the food processor or by rubbing between your fingers until the butter is fully incorporated. For the filling: combine the preserves, berries, and lemon juice and mash with a fork or potato masher until combined but allow the mixture to remain somewhat chunky. When the bottom crust has browned remove from the oven and spread the filling evenly over all. Sprinkle the streusel topping evenly over the filling but do not press it down. Bake until the topping is deep golden brown and the filling is bubbling, 22-25 minutes. Cool to room temperature on a wire rack, at least 1-2 hours. Remove from the baking pan by lifting the foil extensions. Using a chef's knife, cut into squares and serve. For some time bacon is turning up in all sorts of recipes (I recently saw some candied bacon garnishing the top of an candied apple cheesecake). It seems lots of us Americans just can't get enough of the stuff. I felt excited when I realized this recipe makes chicken taste like bacon--different texture but the same flavor. Really great! Some readers may not feel comfortable with cooking with alcohol. I did an online search for recommendations and some said you could substitute sparkling apple cider and vanilla. I've not tried this but if you want to give this recipe a try and don't want to use the bourbon, try a combination of 1/2 c sparkling apple cider and 1/8-1/4 c vanilla. Bring bourbon, soy sauce, sugar, shallot, garlic, and pepper to boil in a medium saucepan over medium-high heat and cook for one minute. Remove from heat and let cool. Set aside 3/4 c of the mixture for basting while cooking. This marinade can be refrigerated for up to 3 days ahead. To cut the chickens into halves, use kitchen shears to cut along both sides of the backbones; freeze and save backbones to make chicken stock at a later date. Flip the chickens over and flatten slightly. Using a chef's knife, split the chickens in half lengthwise, cutting right through the center of the breast bones. It will take a bit of effort but can be done easily enough. (If you prefer, you can ask a butcher to halve the chickens for you.) Cut 1/2 inch deep slits across breasts, thighs, and legs, about 1/2 inch apart. (I thought this was the hardest part of the preparation--next time I think I'll shoot for 1/4 inch slits.) Tuck the wingtips behind the backs. Marinate the chicken halves in the refrigerator for at least one hour or up to 24, turning the halves from time to time. Marinating may be done in a couple of gallon zip-lock bags or in a large covered bowl or container (my preference since I don't have to throw the bags away). Just before grilling, soak the wood chips in water for 15 minutes and drain. Place them in a foil packet and cut several vent holes in the top. These instructions are for a charcoal grill using a chimney charcoal starter. If you own a gas grill, go to the link above and get instructions for that variation. Open the bottom vent halfway. Start a large chimney starter filled with charcoal briquettes (about 6 quarts). When the top coals are partially covered with ash, pour the briquettes into a banked pile against the side of the grill so that the charcoal is only over one half of the grill, leaving the other half for indirect cooking. Place the wood chip packet on the coals. Set the cooking grate in place and cover, venting the lid halfway. Heat the grill until hot and wood chips start to smoke, about 5 minutes. These muffins are nice for fall, with their combination of apples and zucchini. My only complaint is that they don't use enough zucchini!! I didn't have turbinado sugar so used organic sugar instead. Preheat oven to 375F. Line a muffin pan with paper liners or spray with cooking spray. Set aside. In a large bowl, whisk together flour, brown sugar, baking soda, baking powder, salt, cinnamon, and all-spice. In a small bowl, whisk together buttermilk, applesauce, oil, egg, and vanilla extract. Pour the wet ingredients over the dry ingredients and mix with a wooden spoon or spatula until just combined. Do not over mix. Gently stir in the grated apple, zucchini, and chopped apples. To make the topping, combine turbinado sugar and cinnamon in a small bowl. Stir well. Fill the prepared muffin pan with muffin batter, filling each cup about 3/4 the way full. Sprinkle each muffin with cinnamon sugar topping. Bake for 20 minutes, or until muffins are golden and a toothpick inserted in the center of a muffin comes out clean. Let muffins cool to room temperature and serve. The original recipe says these muffins freeze well--I haven't tried it, but it seems like the sugar topping would get soggy. With the abundance of raspberries in my garden I am happy to use this recipe which calls for quite a bunch of them, an advantage to me. Another is that the little cakes can be frozen and pulled out to be freshly baked later. One more is that you can mix this in your food processor after you've chopped the nuts. This recipe can take substitutes for the berries and for the nuts. Cook's Illustrated offers a variation with blackberries and walnuts. See note below. Lightly coat eight 6-oz ramekins with butter or vegetable oil spray and place on a baking sheet. Toast 1/4 c of the nuts in a small skillet until lightly toasted and aromatic. Coarsely chop the remaining nuts and set aside. Process the toasted pistachios, butter, sugar, and salt in the food processor until finely ground, 10-15 seconds. With the machine running, add the cream, eggs, and vanilla through the feed tube and continue to process until smooth, about 5 seconds. Add the flour and baking powder and pulse until just incorporated, about 5 pulses. Transfer the batter to a large bowl and fold in the raspberries. Spoon the batter into the ramekins and sprinkle the top of each cobbler with the remaining nuts. Bake at 375F for 25-30 minutes and serve after resting about 5 minutes. These are also good at room temperature. If you wish to refrigerate (for up to 3 days) or freeze (for up to 1 month), wrap each ramekin tightly in plastic wrap and then in aluminum foil. If these are frozen, let them sit at room temperature for 30 minutes before baking. An additional 5 minutes of baking may be necessary. Note: If you sub blackberries, you may use frozen as long as you pat them dry after thawing them. Use equal amounts of subbed berries or nuts. I haven't tried the blackberries but have used walnuts. I prefer pistachios because they make the cake a pretty shade of speckled yellow. But walnuts are easier to find. My sister-in-law, Diane (I have three! ), made this pantry-ready dip for me when I visited her home about 10 years ago. It quickly became a staple. I've found that I like to add a few things, listed as optional. Mix and eat with chips, nachos, or quesadillas. For flavor homemade barbecue sauce can't be beat but most recipes include instructions to cook chopped onions as the base for the sauce. This tastes great but leaves the sauce chunky, no matter how much I cook the onions down. In this recipe the cook makes "onion juice" for the onion flavor. It's quick and convenient, since the ingredients are already in my pantry. As far as I'm concerned it is just perfect. In a food processor or blender process the onion with the water until the mixture resembles slush. This will make you cry unless you wear onion goggles. Strain the mixture through a fine-mesh strainer into a liquid measuring cup, pressing on the solids to extract liquid until you have 1/2 c onion juice. Discard or compost the solids. Whisk the onion juice, ketchup, molasses, vinegar, Worcestershire, mustard, liquid smoke, hot pepper sauce, and black pepper together in a medium bowl (or if your liquid measuring cup is big enough, mix it in there to save dish washing). Heat the oil in a large saucepan (nonreactive) over medium heat until shimmering but not smoking. Add the garlic, chili powder, and cayenne and cook until fragrant, about 30 seconds. Whisk in the ketchup mixture and bring to a boil; reduce the heat to medium-low and simmer, uncovered, until the flavors meld and the sauce thickens, about 20-30 minutes. Cool. The sauce can be refrigerated for up to a week or frozen. Cook's Illustrated did a test on liquid smoke and found that most are full of who-knows-what chemicals to approximate the flavor of smoke. I believe Wright's brand uses a kind of still to extract smoke flavor so buy that brand if you want smoky sauce. I've battled with leaf hoppers, thrips, and hornworms, plus a disease or two, all of which delayed the harvest but finally we have more tomatoes than we can eat. I'm in heaven! Late summer is berry time in my garden; we've been enjoying strawberries and raspberries for a few years and this year we are having our first small blackberry harvest. It won't be long until the raspberries overwhelm me. But I'm not sorry. When I eat a fruity dessert it is easier to rationalize any sense of guilt away and I love the season when I get to eat as many berries as I want. This version of shortcake is particularly lovely. The brown sugar complements the berries nicely; you don't have to dirty a food processor unless you want to; you don't have to roll the dough out; and the sour cream in the whipped cream stabilizes it and adds a bit a tang which contrasts with the sweet sugar. When we lived in Belgium, our friend Gigi introduced us to one of the most simple and delicious ways to eat strawberries: dip them in sour cream, then in brown sugar, and pop them in your mouth. Fantastic! This recipe captures those flavors. Prepare berries by trimming as necessary. Halve and slice strawberries; leave raspberries, blueberries or currants whole; halve blackberries. With a potato masher crush 2 c berries with brown sugar in a medium bowl and let sit out until the sugar has dissolved and the berries are juicy, about 30 minutes. Prepare the shortcakes by heating the oven to 375F. With your hands mix the flour, brown sugar, baking powder, and salt in a bowl, making sure the brown sugar is fully incorporated. Remove the butter from the freezer and grate it into the flour mixture, using the larger holes of a box grater (or flat). Lightly toss the butter into the flour to distribute it evenly. Whisk the sour cream and egg together in a small bowl and stir it into the flour mixture until large clumps form. Using your hands, knead it lightly until the dough comes together and all the flour is absorbed. If you prefer to use a food processor to mix the dough, you may pulse the dry ingredients together, then drop in tablespoon size chunks of the butter and process until the mixture resembles coarse meal, about 7 pulses. Transfer the mix to a large bowl and add the cream/egg mix. To prepare the cream, beat the heavy cream, sour cream, and brown sugar to stiff peaks. To assemble, split each shortcake in half using a serrated knife. Place the bottom halves on serving plates and spoon some of the fruit mixture over each one, making sure each serving gets a good amount of juice. Top the fruit with the cream and nestle the cake top in the cream dollop. You're ready! Note: As my family knows, I love whipped cream. I advise you to double the cream. It is up to you whether you double the brown sugar. I think the amount of brown sugar makes the cream a bit too sweet, but it does make it a lovely color. This is a long overdue post, and I thought I'd get it up before fresh basil and tomato season is over. We had snow on the mountains last night, and it's heralding the end of my garden, all too soon. Susie's Pasta is named after my dear friend from graduate school, and it evokes memories of cozy evenings in Chapel Hill apartments, sharing dinner and good conversation in days long gone now. Susie served me this pasta when we were in library school together, and it quickly became a family favorite. The fresh herbs and tomatoes make a delicious sauce, and the garbanzo beans tend to nestle inside the shell pasta for a nice surprise when you take a bite. The recipe calls for Roma tomatoes, but I have used a variety of small garden tomatoes and it's worked just fine. Heat olive oil in skillet over low heat. Add garlic and saute 1 minute. Add tomatoes, hot pepper flakes, and salt to taste. Raise heat to medium and saute, stirring often, for 15-20 minutes. The tomatoes will break down and start to form a sauce. Stir in the beans and continue to cook until the beans are hot. In the meantime, boil a large pot of water and cook the pasta until al dente. Retain 1/2 c of the pasta cooking water before draining. Transfer pasta to a large warm bowl. Add sauce, parsley, basil, and toss. Add cheese and toss, adding cooking water as needed to loosen the sauce. I had lots of peaches and raspberries this week, so I tried this recipe. Grind the tapioca in a spice grinder or blender until it is finely ground. In a bowl, toss the peaches with the sugar and salt and let sit for 30 minutes, stirring occasionally. Drain the peaches through a colander set inside a bowl and reserve the juice. Return drained peaches to original bowl and toss with 2 T reserved peach juice and ground tapioca, lemon juice, and vanilla. Transfer to an 8-inch square baking dish (or equivalent) and press gently into an even layer. Top peaches with raspberries. Heat oven to 400F. While the peaches are macerating, combine the flour, brown sugar, granulated sugar, cinnamon, ginger, and salt in a food processor and process until combined (about 15 seconds). Add the butter and pulse until the mixture resembles wet sand (about 8 pulses). Add oats and pecans and pulse until mixture forms marble-size clumps and no loose flour is visible (about 15 pulses). Chill mixture for at least 15 minutes. Spread the fruit with the crumbled topping. Place in center of the oven and bake about 30 minutes until the topping is well browned and the fruit juices are bubbling. Cool on a rack for at least 30 minutes and serve with cream or ice cream. Notes: My first attempt was a little runny so in the future I'll either add tapioca or reduce the amount of juice I stir back into the peaches. I liked refrigerating the topping which kept the clumps together even through baking. But I won't put the pecans in the food processor; they were too finely chopped. My everbearing raspberries have been slowly starting to produce. Here's one tasty way I like to use them. Puree the raspberries in a food processor and pass them through a fine strainer or food mill to remove seeds. Set aside. In a medium-sized heavy saucepan, gradually whisk the cocoa into the cream, stirring until smooth. Add the butter, sugar, corn syrup, and raspberries and stir until well blended. Place the pan over medium heat and slowly bring the mixture to a boil, stirring often. Lower the heat to medium-low and let the mixture continue to boil slowly for 8 minutes without stirring. Remove the pan from heat and allow it to cool for 15 minutes if serving hot. Poor sauce into a container, let cool, cover and refrigerate until needed. It will last for at least month. It may be reheated slowly on the stovetop or in a microwave. Note: I have found that the cocoa doesn't completely dissolve in this sauce which is purely an aesthetic issue. It bothers me a little so I use a stick blender to more completely whisk the ingredients together before heating. Note to anyone in possession of raspberry juice: you can substitute 1 to 1 1/3 c juice for the raspberry puree. Note to those who use Winco Dutch-process cocoa: you may want to use less cocoa since this brand seems darker and rather overpowers the raspberry flavor. My favorite time of year is here with its abundance of fruits and vegetables. I've come to really appreciate a juicy, naturally ripened peach since supermarket suppliers refrigerate green peaches and they rarely ripen properly, instead turning mealy and dry. Here is one method to capitalize on the short, but luscious peach season. This is a whole slice (off one side of the pit) rather than the called for half slices. Begin to heat your skillet or griddle on medium-low. If you wish to serve all pancakes at once, heat your oven to 250F to keep the first pancakes warm while you cook the others. Whisk the egg, sour cream, vanilla, and sugar in a large bowl. In another bowl, blend together the salt, cinnamon, nutmeg, flour, baking powder, and baking soda. Fold dry ingredients into well, mixing until just combined and still a bit lumpy. Note: This makes a relatively thick batter and a thick pancake. I like mine thinner, so I added a third cup of milk to the yogurt. This increases the yield somewhat. Melt a pat of butter in a skillet or on the griddle. Ladle 1/4 c batter, leaving 2 inches between each pancake. Arrange two sliced peach halves on each pancake (don't worry if they are larger than the pancake which will spread). After about 4 minutes, watch for edges that are drying and for bubbles forming in the middle of the peach slices. Carefully use a spatula to get all the way under the pancake and flip it in one quick motion. If a peach slice slips out, you can nudge it back in. Cook for an additional 5 minutes or so until the peaches are caramelized. Be generous with butter which will help with caramelization and with flipping. If peaches brown too quickly and the pancakes aren't done, turn down the heat. Placing finished pancakes in the warm oven will ensure they cook through. Heat a large pot of water for the pasta. Quarter the zucchini lengthwise, then cut into 1/2-inch chunks. Warm the oil with the garlic in a wide skillet. Add the zucchini and season with salt and pepper. Cook gently over medium heat, stirring every so often until the squash is soft and browned in places, about 20 minutes. Add the half and half and cook for 10 minutes more. Meanwhile, add salt to the boiling water and cook the pasta. Drain and toss it with the zucchini, cheese, and basil. Taste for salt and season with pepper. Help: Bumper Crop of Green Peppers! My fridge is filling up with green peppers, and I don't know what to do with them. I have chopped some up and frozen them, but I think I've only got one recipe that calls for them. Friends, I need your help. What should I do with my green peppers? What do you do with green peppers? Betsy and I are doing a test of peach ice cream somewhat complicated by the fact that neither of us can taste the product created by the other. (Oh, well.) This recipe cooks the peaches slightly before mixing them with the cream. To tell the truth it doesn't taste really "cooked" but it doesn't have quite the bright flavor of a fresh peach. Maybe next time I'll try adding a little more of the lemon juice. Halve the peaches, peel, and remove the pits. Cut the peaches into chunks and cook them with the water in a medium saucepan over medium heat, covered, stirring once or twice, until soft and cooked through, about 10 minutes. Remove from heat, stir in the sugar, then cool to room temperature. Puree the cooked peaches and any liquid in a blender or food processor with the sour cream, heavy cream, vanilla, and lemon juice until almost smooth but slightly chunky. Chill the mixture thoroughly in the refrigerator (at least six hours), then freeze it in your ice cream maker according to the manufacturer's instructions. In your freezer, place about 1/4 of the mixture in a shallow container. When it is time to churn the ice cream cut the frozen mix into chunks and stir into the chilled mix. This will lower the temperature of the mix which will give it a creamier texture and reduce ice crystals. These are so easy to make, I'm ashamed I don't make them more often. They receive favorable ratings from nearly everyone I've made them for. Set two oven racks to the upper and low-middle positions and heat the oven to 375F. Line 2 baking sheets with parchment paper and lightly spray with cooking spray. Whisk together the cream of coconut, corn syrup, egg whites, vanilla, and salt in a small bowl and set aside. Combine the two kinds of coconut in a large bowl. Break up any large clumps of coconut with your fingertips. Pour the liquid ingredients into the coconut and mix with a wooden spoon or rubber spatula until evenly moistened. Drop heaping tablespoons of the mixture onto the baking sheets, spacing them about 1 inch apart. Form the cookies into loos haystacks with your fingertips. If you get too sticky, moisten your fingers with water and keep forming. Bake until the cookies are light golden brown, about 15 minutes, rotating the sheets front to back and from rack to rack at the midway point. Cool the cookies on the baking sheets until slightly set, about 2 minutes. Remove to a wire rack to finish cooling. Chop 10 oz. semisweet or bittersweet chocolate and melt 8 oz. in a microwaveable bowl on medium power for a minute or two. Stir the chocolate and, if needed, microwave for another 30 seconds, also at medium power. Stir to ensure it is all melted. Add the additional 2 oz. chocolate and stir until smooth. Hold the macaroons by their pointed top and dip into the chocolate, up the base about a quarter inch. (Because mine were a bit crumbly last time, I used a skewer to help me hang on to them.) You may scrape some of the excess chocolate with your finger, if you wish (I didn't do this step much since I like plenty of chocolate with my macaroon). Refrigerate the macaroons to help the chocolate harden. They don't need to be stored in the fridge unless room temperatures are high. Note: The last time I made these, I decided to try out a couple of variations. I salted a few of them by sprinkling coarse salt over the chocolate right after dipping (the salt was on the bottom of the cookie and although it melded with the chocolate, it didn't entirely dissolve). All my tasters wished I'd done more of these. On a few I also tucked a toasted whole almond into the macaroon before baking. I think I will make some with toasted, slivered almonds next time because the flavor was good but the big hunk of almond made for an odd texture and it would be nice to have the almond flavor throughout. My father-in-law paid me the nicest compliment the other day, after enjoying Grandma Betty's Zucchini Bread and a side dish of shredded zucchini with herbs (separately, not together!). He said, "You're a magician with zucchini." I'll add that to my list of job titles: zucchini magician! Here are two zucchini soups. The first is from a neighbor, who told her kids she was serving green monster soup for dinner. The name was enough to entice her kids to eat it, but unfortunately it didn't work on mine. In fact Gabe said "I'm scared of monsters!" and then refused to have anything to do with it. The second, a bisque, is from a restaurant that used to be in St. George, Utah called the Gable House. My great-grandmother Melba enjoyed the soup there. Green monster soup is creamy and of course the bacon garnish is tasty. The bisque is lighter, with nutmeg a flavorful addition. Take your pick and enjoy; I like to accompany these soups with grilled cheese sandwiches. In a large saucepan or Dutch oven, melt butter over medium heat. Add onions and cook until tender. Add sliced zucchini and chicken broth; bring to a boil. Simmer until tender, about 15 minutes. Add salt and pepper. Cool slightly. Puree in blender, in batches if necessary. Return to pan and stir in half and half. Reheat but do not boil. Stir in grated cheddar cheese and sour cream. Garnish with crumbled bacon at the table. In a large saucepan or Dutch oven, melt butter over medium heat. Add onions and cook until tender. Add sliced zucchini and chicken broth; bring to a boil. Reduce heat and simmer for 15 minutes. Add seasonings. Puree in a blender, in batches if necessary. Return to pan and stir in half and half. Reheat, but do not boil. Garnish with cheese and croutons, if desired. Apparently chocolate is my only comfort food. This time I added chocolate to banana bread, because I had bunches of bananas going bad on my counter. Dark chocolate chips are my favorite, of course, but use whatever you like. 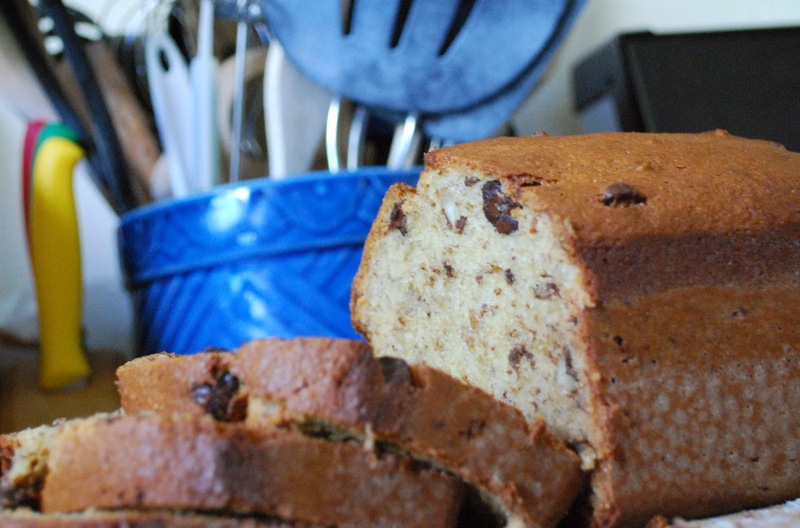 And the chocolate really is optional; this banana bread with walnuts is lovely on its own. Preheat oven to 350F. Cream sugar and butter; then add bananas, eggs, and vanilla and blend well. Add dry ingredients and mix. Fold in nuts and chocolate chips, if using. Bake in greased, floured loaf pan for one hour or until toothpick inserted in center comes out clean. Cool in loaf pan for ten minutes, then remove the bread and set it on a rack to cool completely. This isn't a real recipe, but it is a new idea for using the ENTIRE strawberry, before throwing the tops away. Simply immerse the strawberry tops in a glass of water for an hour or so. Then enjoy a refreshing, berry-flavored drink! Betsy and I discovered this together during one of several visits with each other this spring. Bread puddings are comforting desserts by nature but add the chocolate and you can almost drown your sorrows. Place oven rack in the middle of oven and preheat to 350F. In a large bowl, whisk the cream, milk, brown sugar, eggs, and vanilla together. Add the bread and gently stir to coat well. Set aside for about 20-30 minutes to allow the bread to soften and soak up some of the egg mixture. Fold the chocolate into the bread mixture. Transfer to a buttered 9X13 baking dish. Sprinkle with the granulated sugar. Bake for about 50 minutes or until the pudding puffs and is golden brown on top but still moist inside. Cool slightly before serving. This can be microwaved to warm leftovers although some of the crispiness of the sugar topping will be lost. Betsy and I have access to a less-than-sour sourdough bread which is lovely in this recipe. In its place I'd seek out a loaf of challah bread. Sometimes the Italian loaves sold in supermarkets are awfully airy and I think this pudding would be a bit mushy with that kind of bread. Go for something with some substance. Remove hard crusts. Cook's Illustrated makes these recommendations: "If you cannot find challah, a firm high-quality sandwich bread such as Arnold Country Classics White or Pepperidge Farm Farmhouse Hearty White may be substituted." I find that when using chocolate chips, they have a tendency to sink to the bottom of the pan. Give the mixture a good stir once you've placed it in the baking pan, before sprinkling with sugar. If you find you don't like the sunken chips, reserve a handful or two and sprinkle them over the top of the pudding (and under the sugar) before baking. Betsy and I were the only people eating this when I made it so a 9X13 pan seemed awfully large. I divided the recipe between two casserole dishes (or it could be divided into two 8X8 pans). One, I lined with foil, leaving an overhang so I could wrap it after baking. I buttered the foil lining (just like the unlined pan) and placed half the pudding in each pan. I sprinkled sugar over the pudding in the unlined pan only. Both pans went into the oven together and were baked at the same time. After cooling, I wrapped the foil around the top of the baked pudding and sealed it. I then placed it in the freezer and when it was frozen, I took it out of the pan. When Betsy wanted the pudding some weeks later, it was waiting for her in the freezer. She placed the frozen pudding (still in the foil, but having removed the top covering) in the original casserole dish, sprinkled some sugar on it and let it heat at 300F for 45 minutes. You could let it thaw and heat it for a shorter period of time, possibly 20-25 minutes. This is good with a dollop of whipped cream, or plain cream poured over the top. If you like to gild lilies, it can be topped with ice cream, and/or caramel sauce. In that case, I think some flaky salt sprinkled over all would keep it from being cloyingly sweet. This isn't comfort food exactly, but my mom made it last time she was here taking care of me, so there's the connection to comfort. The original article billed this as cauliflower even kids will eat, which wasn't true for my kids. But I sure love it. The combination of spices and nuts makes this a keeper, and it's super easy to roast while you're cooking other parts of the meal. Preheat oven to 425F. Mix spices, salt, and oil in a small bowl. Scatter the cauliflower florets over a rimmed baking sheet, then toss with the oil-and-spice mixture. Roast for 15 minutes, then stir and roast for 10 more minutes. Sprinkle on the almonds and roast for another 5-10 minutes, or until the cauliflower and the almonds are nicely browned. Serve hot, warm, or cold. Chocolate makes everything better. I laughed when I saw this photo on a friend's blog recently, about interesting product placement in our local grocery store. I was looking for freezer meal recipes when I bumped into the recipe for these waffles. With two kinds of chocolate of course they're tasty, but they're healthy-ish, too, with whole wheat and a vegetable. I think they're sweet enough just on their own, with a little butter, but the original recipe recommended serving them with syrup. These waffles freeze well. Simply defrost for a minute or two, then pop in the toaster, and you end up with a crisp waffle with melty chocolate chips: a perfect breakfast or snack. My little guys loved them. Mom made them for me recently. And when I pulled them out of the freezer after she left, they were all the more comforting because she had made them. Couldn't keep little hands away! Mix dry ingredients (flour through cocoa) in a large bowl. In a separate bowl, whisk together brown sugar and melted coconut oil. Whisk in beaten eggs, milk and pureed pumpkin. Add wet ingredients to the dry ingredients and whisk until just combined (do not over mix). Stir in chocolate chips. Cook using waffle iron, until done. We find ourselves in need of comfort food these days. Once during a class I was asked to imagine my most comforting meal as it cooked in a kitchen. Many of my classmates imagined things like a pot roast, with potatoes and carrots. My meal was chicken noodle soup and sweet sourdough bread. Popcorn is another ultimate comfort food for me. Unusual, I know, but I think it must be tied to my memories of watching movies with my family every Friday night growing up. We would pop big bowls of air-popped popcorn, then add butter and salt. And we'd gather in front of the TV to watch something new or an old favorite. When I left home for college, my mom gave me a hot-air popper, and I still use it. In fact, one of the first things I made in my new apartment as a freshman was popcorn, and I didn't have a microwave yet so I had to melt the butter on the stove. My inexperience with American stoves after living in Europe led to a kitchen fire and a big mess. Luckily there was no permanent damage. All in pursuit of a little comfort by a lonely and homesick freshman! There are many ways to prepare popcorn, but let me share this tip from Alton Brown as an easy way to get air-popped popcorn without a popper. Place 1/3 c popcorn kernels in a regular brown paper bag, like what you'd use for a child's lunch. Fold the top over a couple of times, and staple it on both sides. Cook in the microwave for several minutes, or until the popcorn slows to a pop every couple of seconds. Enjoy as is, or pour into a bowl and add 1 T butter and salt to taste.